The privileged position at Enghien-les-Bains, in the suburbs North of Paris, gives visitors the ultimate opportunity to combine a golf holiday with a chance to experience the sights and sounds of the French capital. 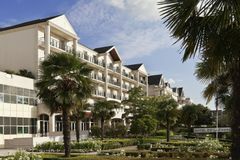 Golfers will appreciate the location, which allows easy access to the courses at Paris International and Golf Isle Adam, while back at the Paris hotel, the excellent three star accommodation comes courtesy of 141 rooms and suites, all decorated in a classic fashion and well equipped for comfort. Access to the nearby Barriere Casino and superb dining options are among the highlight of this popular Paris golf hotel. The Spark is the Hotel du Lac's magnificent wellness centre, spread across two floors and offering an endless menu of luxury spa therapy, based on its 24 superb treatment rooms. Relaxation areas, aqua circuits, steam baths and saunas are among the addition features at The Spark. The hotel's Café du Lac provides traditional and creative French cuisine, while the nearby Barriere Casino boasts a number of fabulous dining options.